One of the things that will be critical to the success or failure of Eurydice Games is my ability to focus on what's important and get it done in a timely fashion. At work I use Trello extensively to keep track of and prioritise myriad tasks, so it makes perfect sense to replicate that for Eurydice Games. So I have set up the Trello board shown above for Eurydice Games. For the moment it's a single board with all the tasks I'm aware of on it. As and when I think of something else I add it to the board immediately, rather than trying to remember it (and inevitably forgetting). I can get a quick view of everything on my plate. Trello brings several other benefits: I can label tasks and then filter them (I've currently got labels for the three games I have in active development, company stuff and blog post ideas), I can give tasks a due date and get reminders when they are approaching. I can also see tasks moving through the process and get the dopamine spike from incremental achievements. You can also include notes and checklists on tasks too. I use Trello in a Kanban-esque fashion, with lists for future tasks, tasks to do in the next month, tasks currently in progress and tasks completed in the last month. Weekly and monthly maintenance keeps those lists up to date so I can focus on what is most urgent which is particularly important around a full-time job and a young family - I've little time to devote to this effort, so I want to make sure I'm using it effectively. One of the reasons Reiver Games failed was that I lost focus when things got difficult. As sales came in slower than expected (hard to see as I didn't have a business plan with sales projections!) I became disillusioned and to some degree gave up. I had no idea how to drive sales of my games in far flung shops, so instead of spending every minute hustling to drive awareness and sales of my games (and I was doing it full-time at that point, so there was plenty of time available) I slumped and started watching more and more TV each day. Clearly with my limited time this time round that is not an option, I need to stay laser-focused on bringing my games to people's attention and finding those customers who would be interested in buying my games. I still don't completely know how best to do that, but with 200 (instead of 3,000!) copies to sell it should be easier this time. I give almost all my tasks an aggressive (yet achievable) due date, and then work hard to achieve them. There's loads to do at the moment (I'm setting up the company, designing a website and organising the printing of my first game) and, with upcoming family holiday and work trip to Massachusetts, even less time than usual to do them. I'm doing a bit most evenings and also often during my lunch break at work. Once those things are out of the way the next focus is hand-making the pre-ordered games which take 45 minutes each. 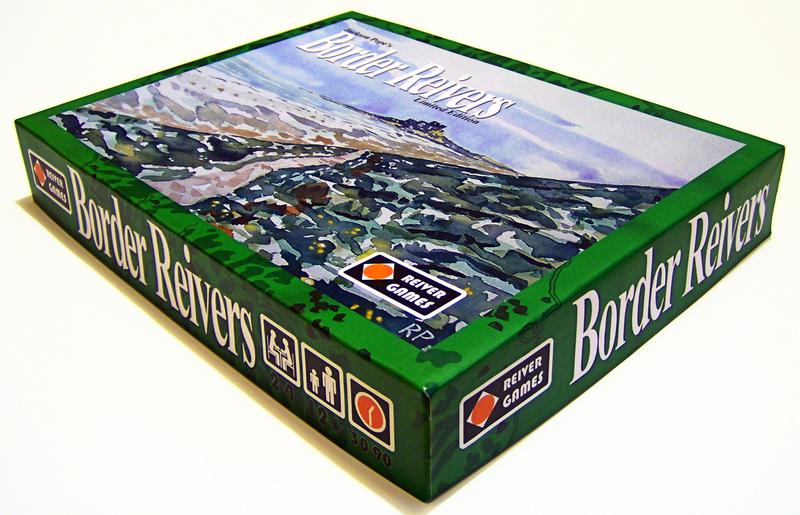 Eleven years ago this month I founded Reiver Games to self-publish my first game: Border Reivers. Then, as now, I was intending to make a small print run (100 copies for Border Reivers) by hand and to try to sell them via my website, BGG and by attending games clubs and conventions. A lot has changed since then, both personally and professional and in the world in general. It'll be interesting over the next year to see whether my plan to essentially try to repeat the early successes of Reiver Games still works in the world of 2017, rather than 2006. The month after I founded Reiver Games I experienced my first Multiple Sclerosis symptoms. It took another seven months to get a confirmed diagnosis and then I had a pretty unpleasant couple of years of frequent relapses and constant fear over what my future would hold. Thankfully, I was lucky enough to get on a clinical trial of a treatment that has worked wonders for me - I've now been relapse free for eight years. When I started Reiver Games I had a job that involved a reasonable amount of international travel, and the 300 hours of hand-making games in the first year, and then 450 in then second year was a struggle to fit in around the travel and wanting to spend some time out of work with The Wife. So I jumped at the chance of investing some of my life insurance money (yay MS!) into the company and quitting my job and going full-time. Of course I now have another job that includes a reasonable amount of international travel and I've still got a (the same!) wife and now two daughters under five too (one's only eight weeks old!). I'd like to spend some time with, so I'm back in the same boat as the beginning of Reiver Games. Thankfully Zombology only takes 45 minutes to make, so I'm looking at 113-150 hours of construction in the first year, assuming I can sell them all within a year, so that burden is lower at least. I'm hoping I can get this done in one or two evenings a week after the daughters have gone to bed. Skills-wise I've learnt a lot in the last eleven years, not least having five years of board game publisher experience that I didn't have last time round. I also now manage a decent sized budget at work now, so I'm a lot more finance-savvy than I was the first time around. I've also got a lot of contacts in the board game business and enough people know me that I can say 'I'm getting back into self-publishing' on BGG and get a few pre-orders purely based on my previous reputation! My parents have been up this week, so I've had a chance to pick the brains (how appropriate!) of my dad, a retired art teacher. I've been trying to finalise the artwork for Zombology ahead of getting a proof copy done by the printers to check the colours look OK and that the lamination works on top of the new art (if there's too much ink the lamination doesn't adhere). Over the last couple of weeks I've been crowdsourcing advice on the art/graphic design, from dad, The Wife, BGG, Google+ and twitter. What do you think? Let me know any comments you have in the next couple of days - that way I can act on them before it goes to the printer. I've spent this week (and by this week I mean the hours of 9-11pm, holding an almost sleeping baby in one arm while) trying to finalise the art for the new version of Zombology taking into account the feedback I received here and on Google+ for the last version I posted. With the exception of the box art, it's almost done. With it almost done, I don't want to share what I've got until I've finished, so instead I thought I'd talk about my business plan instead this week. When I ran Reiver Games my initial business plan consisted of 'Make games by hand, without taking any salary and sell them for twice the printing/pieces cost so I've got some money to cover expenses, trade show attendance and to invest in new games'. Seriously, that was it. It's a wonder I was at all successful. But I was. Fast forward two years and I'd nearly quadrupled my initial stake and I had my life insurance payout to partially invest. This was the moment when I needed a rock solid business plan, but again I had none. The result this time? Losing a bunch of money, selling games to liquidators at 19p each and two years with no salary earnt at all. That'll teach me. This time round I'll be trying to replicate the first half of that, not the second one! But, I also need to ensure that I learn from my mistakes. I'm older and hopefully wiser this time, and with experience now of managing a large budget in my day job. So I need to make sure I've though out how this could go down. As with any investment, this is a gamble: I could win big, or I could lose it all. I'm intending to invest £1,000 in the company to fund the setup costs, stationery, website hosting and printing of Zombology. So I've potentially lost a grand. Which would be bad. I've already got a bunch of pre-orders, so assuming everyone who has pre-ordered actually pays for a copy, that's down to £840 at risk. Still a significant chunk of cash. I'm still hovering between making 150 and 200 copies of Zombology v2 and to take advantage of the economies of scale I need to decide this before ordering the printing next month. If I sold them all (I'll be giving a few away to reviewers) then the potential payout is £1,500 to £2,000, so at worst I lose £840 and at best I gain £1,000 on top of my original stake. Now that gain also has to pay for a bunch of things: website hosting, stationery, travel and expenses for attending conventions or games clubs, so it'll be less than that, but that's an upper limit on my payout in the first year. Other than that, just five copies a month through my website and the BGG Marketplace. That's 135 gone in the first year at an average effort of 2.5 hours of game manufacturing a week (should be just a single night a week of effort on average). If sales dropped to two per month in the second year with another 10 at the UK Games Expo in 2019 then that would be another 35 taking me to 170 in total. Now obviously there's quite a lot of risk in that. Is there still a market for hand-made games in this era of Kickstarter? 17 people say yes, but that's a shed load less than 200 or even 150. Are my sales estimates accurate? Can I shift the games through BGG? My website? Is 50 copies at £10 each reasonable at the Expo? The numbers I'm basing this on are 11 years old, and pre-Kickstarter. Pretty soon I'm going to have to make a decision about 150 vs. 200. It'll be time to put my money where my mouth is. Literally. I Need Your Help, Please! If you read this blog regularly you are among my biggest fans - thank you very much for your support over the last 11 years of my game design career. As a regular reader (you're not? Ok, start here and then continue until you're up to date! ), you'll know I'm about to get into self-publishing hand-made games again. I've got previous for this - the first two very successful years of Reiver Games from July 2006 until July 2008 when I made 400 games by hand (Border Reivers and It's Alive!). But things have changed. There was no kickstarter back then, and certainly in year two I had built up a bit of a fanbase and had a mailing list of interested gamers. 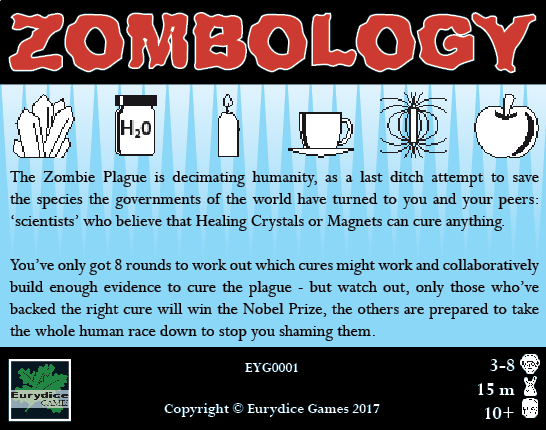 Do you own Zombology, and have played it? Please provide an honest rating and comments on BoardGameGeek, please also download the second edition rules and introduce it to new people and let them know I'll be making another hand-made run of it shortly if they'd like a copy of their own. 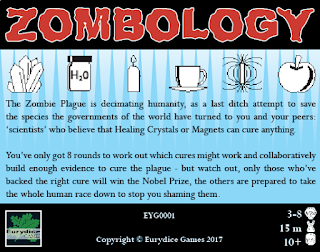 Do you own Zombology but you haven't played it? Please also download the second edition rules and introduce it to new people and let them know I'll be making another hand-made run of it shortly if they'd like a copy of their own. Then please provide an honest rating and comments on BoardGameGeek. Do you own one of my hand-made games? If you have a copy of Border Reivers, It's Alive! first edition (grey box) or Zombology, please could you provide a quote I can put on my website about the build quality of my hand-made games? 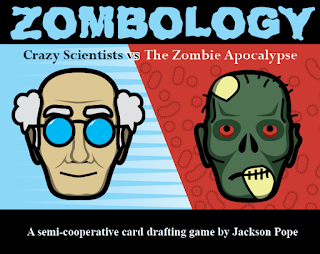 You can still provide feedback on the new rules, if you know anyone who likes zombies, mad scientists, fillers, semi- co-operative games, card-drafting, and/or hand-made and rare games to the Zombology BGG page or this blog. Tell them there's a new version coming shortly and they can pre-order a copy of the world's only game about curing the zombie plague using healing crystals and magnets from me for only £10 + P&P. Thanks in advance for spreading the word!